Using powdered glass frit to produce a unique glass fused jewelry pendant. 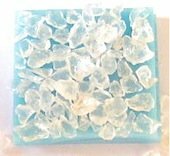 In this tutorial, the second on this subject glass squares along with frit and powder are combined to make a fused glass pendant. Bullseye Glass has been used for this project. System 96 will work just as well. Unlike the previous tutorial the powder will be sifted over the coarse frit rather than under it. Two pieces of glass 11/4 inch square. 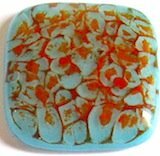 Cut two pieces of glass about 1 1/4 inches square or larger. Place them on top of one another. Place pieces of coarse frit on top of the squares. You may need to use the tweezers to place frit around the edges of the squares. Once the surface is completely covered you are then ready to apply the powder. Wearing a face mask spoon some powder into the sifter, gently tap the sifter until the coarse pieces are completely covered with powder. Place a piece of thin fire paper on a kiln shelf and gently move the assembled pieces onto the shelf. Place the shelf into the kiln, gradually bring the temperature up to about 1500 F (815 C) and hold for about 20 minutes. Check to see that is fully fused, if so switch off and let pendant cool to room temperature. As can be seen from the photo you will have an irregularly patterned finish. You can have fun with this technique through experimenting, use medium frit, combined powder colors, sprinkling a different powder colors as well as having a base cover of powder. Changing the shape of the base glass as well as using varying colors along with transparent frit will give you very unique and original designs.